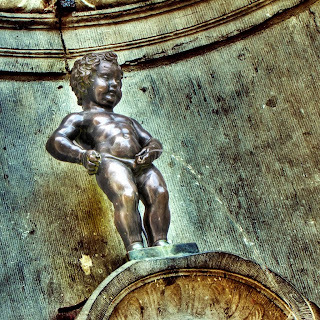 Manneken Pis, Dutch for “Little man, urinating,” is a famous Brussel’s landmark. Each student has a “credit card” good for five trips to the restroom or drinking fountain in a week. Need to pee? Your card gets punched. Feeling thirsty? That’s a second punch. Maxed out your credit card by Wednesday? My sons shrugged for lack of an answer. They don’t ever plan to get to that point, they assured me. They’re going to dominate their bladders until noon, when everyone is allowed to pee freely. 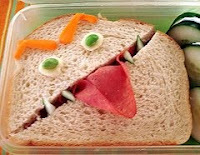 “Angry sandwich” courtesy of Sakurako Kitsa. What kind of teacher would develop a policy that could lead to bladder infections, constipation and embarrassing accidents? But, keeping in mind the excellent advice about experiencing discomfort from Geek Feminism’s post “Notes from a PTA mom,” I decided to let my boys solve this. Each morning, they fill bottles of water to keep at their desks. Each afternoon, they make a beeline for the bathroom. Get out of their way; otherwise, urine trouble. seriously, I wouldn't say it unless it was true…that made me crack up! Snort-like crack up. that's weird, I'm like, a weird number! well, you know who I am! Yeah, littlest sis, I know.